Bookending the horizon are the Temple of the Sun and Temple of the Moon, two sandstone monoliths in Utah’s Capitol Reef National Park. 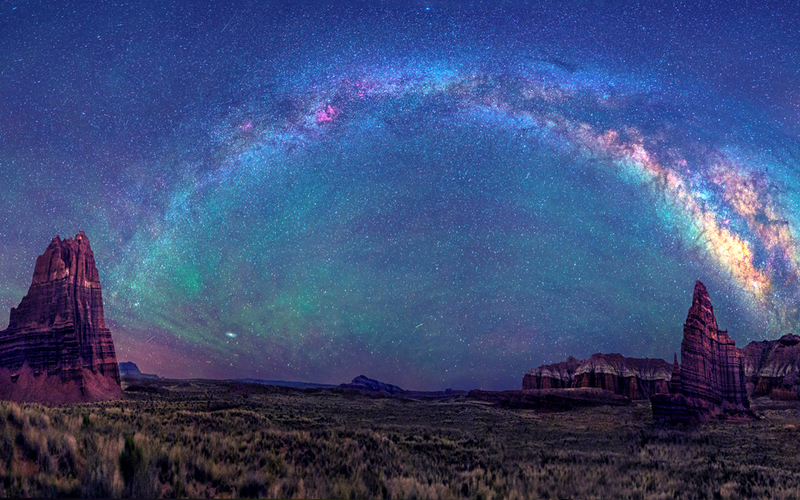 Decorating the night sky above is a glimpse of our own Milky Way galaxy. Sixteen photos were merged into one composite to create this image. If you look closely in the lower left quarter of the picture, there’s a particularly bright “star” with a small halo. That’s the Andromeda galaxy, the galaxy closest to our own. Astronomers theorize that in less than 4 billion years, Andromeda and the Milky Way may collide.